Ground almonds, sliced almonds and almond extract lend a lot of nutty flavour to these low sugar whole wheat almond scones. To create a delicious toasted almond topping, brush the scones with egg wash and sprinkle on some sliced almonds. 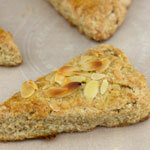 The almonds turns golden and toasty as the scones bake. Preheat the oven to 425 F. Line a baking sheet with parchment paper or a Silpat. In a large bowl, whisk together the flour, almond meal, baking powder and salt. Add in the cold butter and using a pastry cutter or 2 knives, cut the butter into the flour mixture until the butter is evenly distributed and no large lumps remain. In a medium bowl, whisk together the eggs, cream, applesauce and almond extract. Stir the egg mixture into the flour and mix until soft dough begins to form. Gather dough into a ball. On a lightly floured work surface, pat dough into a disc about 1 inch thick. Cut into 12 wedges. Place the wedges on the baking pan. Mix together the egg yolk and half and half cream. Brush the tops of the scones with the egg yolk mixture and sprinkle with the sliced almonds. Bake for 15 minutes or until the tops are light golden brown. Let cool on a wire rack for a few minutes. For a sweeter scone, replace the 2 tablespoons of unsweetened applesauce in the Mildly Sweet recipe above with 2 tablespoons of sugar. Whisk the sugar in with the eggs, cream and almond extract in step 4. Omit the unsweetened applesauce. Adapted from: Almond Scones with Tangerine Curd from The Williams-Sonoma Baking Book: Essential Recipes for Today's Home Baker.